The first 25% took 6 months, it took a little over a year to bring it to 50%, and now achieving 75%, has taken one year and nine months. As I explained in the 25 – 50% review, the book split for the last half of this endeavor is 21/21 – I now have 65 of the 86 books required to reach my goal. While bringing my collection to this point is gratifying from a purely statistical perspective, this has been the most unfulfilling period from the point of view of my commitment to reading and this blog. In addition, I’ve been several hundred dollars distracted by Gene Wolfe and Brian Aldiss. In the last progress report, I bemoaned the fact that my reading and contribution to this blog was poor. This time around it has been poorer, and is a reflection of my lifestyle and general deportment over the past year or so. But setting my personal situation and attitude aside, what about the books?? Let’s check out these 21 books. 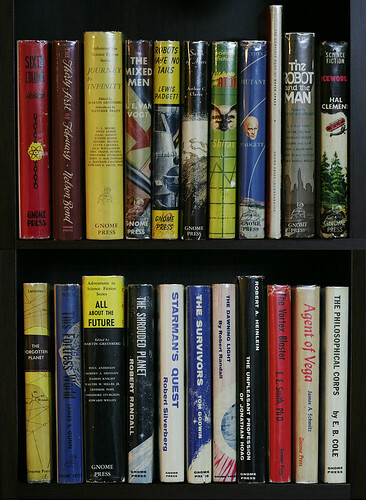 You’ll notice an odd detail on these books. Aside from the nasty reflections, they all have a kind of seam-line down the center of the spine. This is the heat-shrink plastic casing I put on all my books now in addition to the standard Brodart dust jacket covers that I apply. This extra layer of protection keeps the atmosphere (humidity, dust etc.) away from the books. Vacuum-packing them would be nicer, but I don’t have access to that kind of equipment here. If you were counting, there are actually 22 books here. You will see the group includes the Gnome Junior jacketed version of Murray Leinster’s The Forgotten Planet. As you may know, I picked up this title in the regular issue jacket some time ago. This version is here because it’s a high profile addition to my GP collection. But because I already have this title, I haven’t factored it’s $300 price tag into the ‘Most Expensive’, ‘Cheapest’ and ‘Average Price’ categories below. You might say something like “Hey, what about the limited edition The Thirty-First of February. You’re including that as a stand-alone title.” Yes I am. I consider that a completely different publication to the regular version. It has several important binding differences and was specially created to stand apart from the other. The Forgotten Planet here is a dust jacket variant only. Another thing you may have picked up on is that The Menace from Earth has no dust jacket. This is because the jacket is away at Craft Bookbinding Co. getting restored. Interplanetary Hunter by Arthur K. Barnes – a solid Near Fine if not Fine. Pohl’s Drunkard’s Walk and The Bird of Time by Wallace West both come close. The Carnelian Cube by Fletcher Pratt and L. Sprague de Camp – Poor. Quite frankly, I don’t know why I bought it. Against the Fall of Night by Arthur C. Clarke – $235. The Bird of Time by Wallace West – $10. A nice little bargain. $54. If we include aforementioned variant of The Forgotten Planet, then this average leaps to $65. But we don’t, so it’s up from the $47 for the second quarter, but less than the $57 for the first. Reading is an area where I hang my head in shame. Of the books in this bracket, I have only read Mel Oliver and Space Rover on Mars. Sure, I read The Thirty-First of February and The Forgotten Planet earlier as part of the previous sections, and did listen to both The Menace from Earth and Against the Fall of Night a long time ago in audio form, but of the titles we are really concerned about here I’ve actually read only the one. However, Mel & Rover is a super read, classic quality YASF. Surprises can be both positive and negative, right?? Is a negative surprise called a shock?? Anyways, Robert Heinlein’s The Menace from Earth fits that bill. I commented on that in detail in this post here. Procuring Against the Fall of Night and the limited edition The Thirty-First of February at reasonable prices – $235 and $52 (wow) respectively. Adding the Gnome Junior jacketed version of The Forgotten Planet to the bookshelf. My first Conan title – Conan the Conqueror. Getting a Conan title is a nice satisfactory tick off the list. Well, it’s been one year today since I made the first post on this site. It has been a great year for me in working towards my goal of collecting all Gnome Press’ hardcover titles. I’m almost halfway having only to acquire four more titles to hit that point… or is it only two – I have jacket-less reading copies of City by Clifford Simak and C.L. Moore’s Northwest of Earth. But I’m really only counting collectible copies, so four it should be. Things are slowing down a bit at present. The remaining titles are starting to become a little more expensive and things are biting at home a bit too… but on it goes regardless. I have examined and reviewed most of the books I have, but in the interests of keeping a steady input into this blog, I’m going to slow down a little on that too. Thankfully there is a little more material around that I can feed into this site, both on my bookshelf and out there in general. I feel like I should do a highlights package, but I’ll leave that in the style I have set with the 25% marker – it can wait for the 50% post. After all it’s not that far away. I’ve made a couple of Gnome Press friends out there over the course of the last year and I want to thank them for helping to make this blog what it is. Christophe in France especially, Brian Pearce from Red Jacket Press, Joe Wherle Jr, Mike ‘bossy4dom2‘ Wood and Geoff Robson whom I hope is still hanging on to a special GP title for me. And of course my Lovely Wife for enduring my seemingly nonsensical hobby. Merry Christmas to all. Gnome Press, 25% down and 75% to go!! The second thing is I’ve come in contact with some very friendly and helpful dealers and collectors and learned a lot. People have been very willing to give me anecdotes and a bit of history if they can. I appreciate all of it very much. There are 86 volumes in the Gnome Press publication catalog. That’s regular hard-cover books. There are of course some other bits and pieces like a small amount of paperbacks, newsletters and a couple of calendars and so forth, and one limited edition volume (which incidentally, a copy of which is ear-marked for me… thanks Geoff). 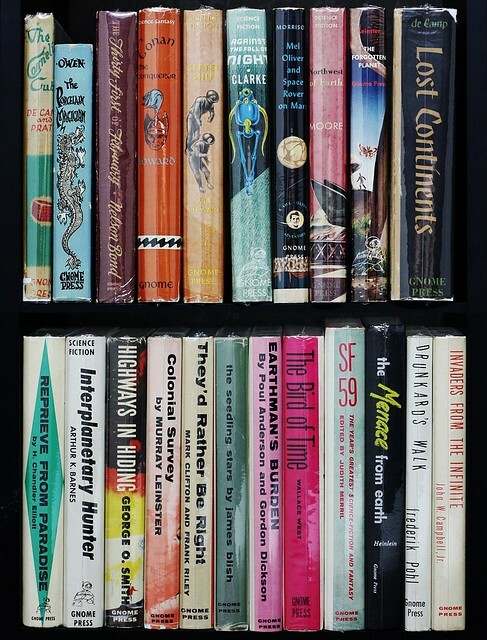 Below are the 22 volumes I have in my Library thus far in what I think is order of publication. Click the pic for a bigger and more detailed view. So, where to from here?? I’m under no illusions it’s only going to get more expensive and more difficult. My frenetic pace of acquisition will be slowing down. The next 25% will be slower and so too the next, and the final quarter… well… gulp… that giant monster ‘I, Robot’ lurks. However, the road to 50% does start with a bang – I already have seven volumes nailed down and due when I get around to paying for them over the next month or so. I’m now going to do something rather inane and compile a kind of highlights package of 0 – 25%. Agent of Vega by James H. Schmitz. For two very different reasons. The book was in poorer condition than I expected, it has crappy cover art but it was an unexpectedly good read. Highly recommended. Getting my first RAH 1st edition (Hoag). Being wonderfully entertained by Padgett’s Robots Have No Tails. 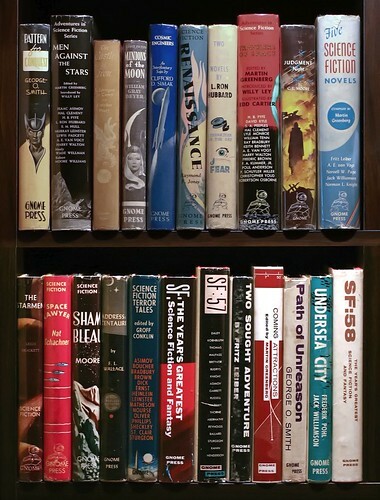 Getting hooked by Martin Greenberg’s ‘Adventures in Science Fiction Series’ concept collections. Discovering Nelson Bond – what a great writer that guy is. To wrap this post up, I’m having a fantastic time in this endeavor. I’m discovering new authors, reading some wonderful stories and accumulating a slice of real science fiction history. I hope you stick with me.